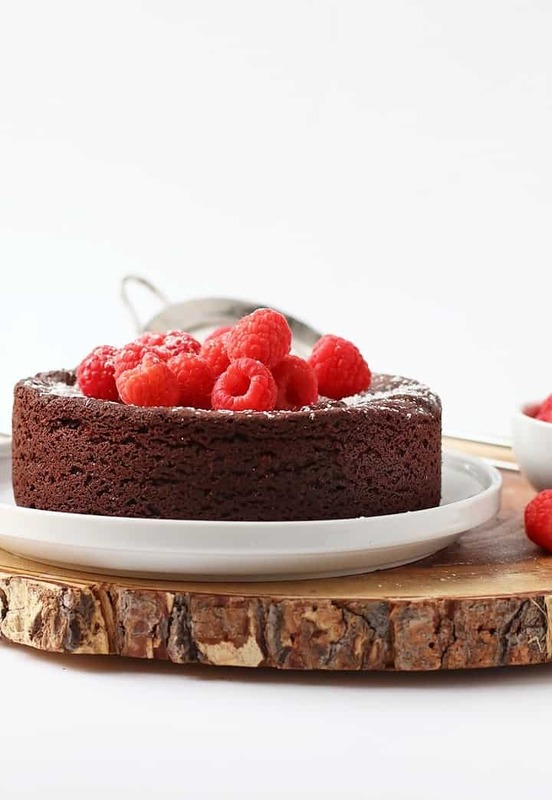 This rich and dense vegan Flourless Chocolate Cake is also gluten-free for a decadent dessert nearly everyone can enjoy. Made with just 7 simple ingredients for a quick and easy sweet treat. Before my blogging days, I spent many years as a baker. Among my most notable jobs, was the cake maker at a popular dessert restaurant here in Portland. There I learned how to make the perfect meringues, chiffon cakes, Italian buttercreams, and French gateaus. These recipes were all traditional (non-vegan, that is) and so I spent a lot of time justifying my decision to work in an environment that was at complete odds with my deepest values. I told myself that someday, after I understood the technique and had enough financial freedom to be a bit choosey about where I worked, I would take everything I learned from my time in the food service industry and veganize it. I’ve worked on this goal over the past 6 years of blogging, veganizing desserts such as creme brûlées, pots de creme, baccone dolces, and so much more. Every time I perfect one of these delicate desserts that rely so much on eggs, I feel immense satisfaction that I am making dreams come true. But I’m not done veganizing. And so today I bring you this vegan flourless chocolate cake. This flourless chocolate cake is another classic dessert I made a lot in the various bakeries I worked in. Traditionally, rather than relying on flour for the structure, this cake relies on eggs. 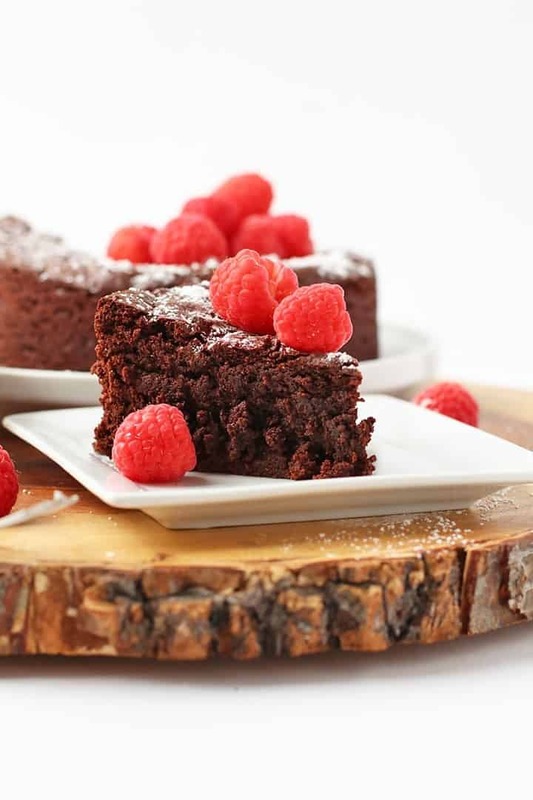 This technique gives the cake a delicate structure that is incredibly rich and decadent, more similar to a brownie than a cake. 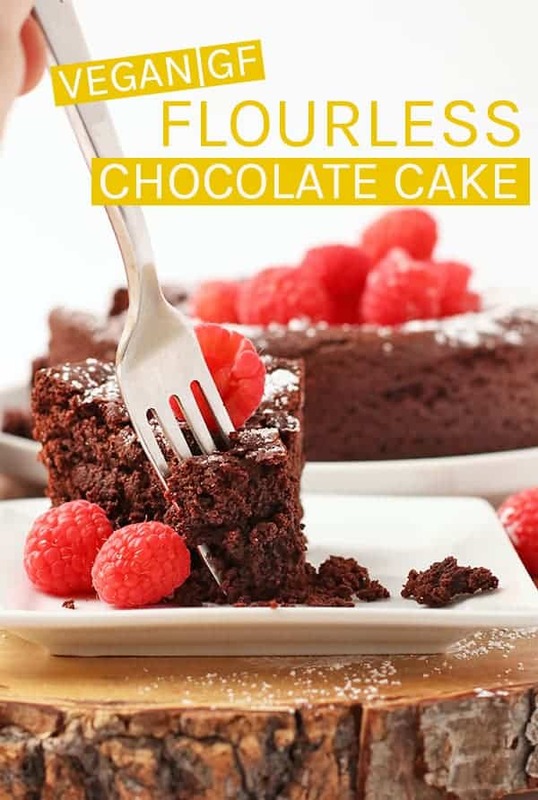 Because flourless chocolate cake relies so heavily on eggs, this vegan flourless chocolate cake took some experimenting. After 5 attempts, I discovered the perfect egg replacer (the chickpea egg) and the perfect ratio of liquid to chickpea flour. I love the chickpea flour because it has serious binding powder, similar to that of eggs which gives the cake it’s structure. It also is completely flavorless* meaning it won’t affect the taste of the cake itself (unlike some other vegan egg replacers). And, lastly, it’s super simple to work with. There is no grinding, blending, whipping, or crossing your fingers that everything will come out okay. In truth, it shouldn’t have taken me so long to come up with this recipe. I already know chickpea flour is perfect for vegan French toast, lemon curd, and molten lava cake. 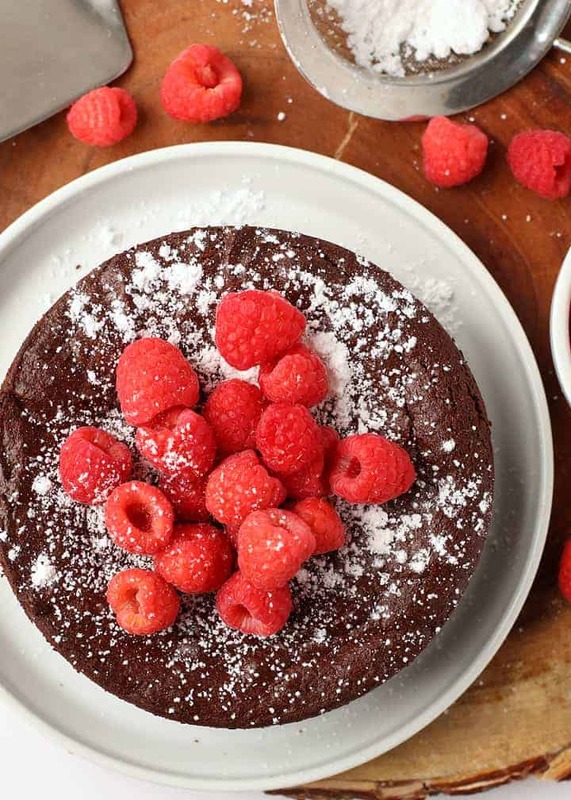 Why wouldn’t it be perfect for this vegan flourless cake?? *IMPORTANT – while cooked chickpea flour is completely flavorless, raw chickpea flour has a potently unpleasant taste. That means you won’t want to be licking the spatula for this recipe. Unlike most of my recipes, this cake does require some baking knowledge and technique. 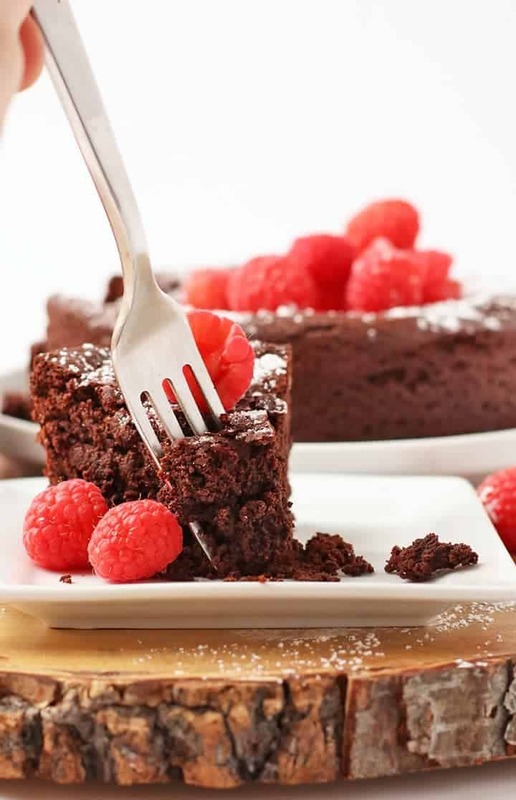 But if you follow these step-by-step instructions, you’ll be able to make a rich a decadent flourless chocolate cake, too! 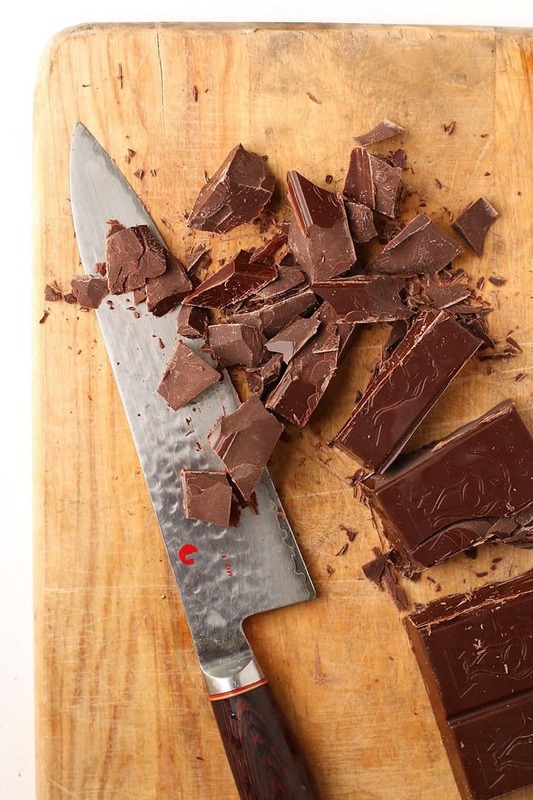 Roughly chop your chocolate and place it in a metal bowl with the vegan butter. GENTLY melt your chocolate and butter over medium-low heat. This can be done in a double boiler or with a metal bowl placed over a pot of steaming water that has been removed from the heat. Stir the chocolate/butter mixture with a spatula, taking careful effort not to over mix. While chocolate melts, whisk together chickpea flour and soy milk until a thick gooey paste has formed. Make sure chickpea mixture is evenly hydrated throughout. Make sure to completely hydrate the chickpea flour and soy milk. This can be done with careful stirring or you could blend it up in a small blender. Once the chocolate and butter are melted, stir in sugar until it is dissolved. Add chickpea/milk mixture, stirring with a spatula to combine. Fold in cocoa powder and baking soda until a uniform batter is achieved. Again you want to be careful not to agitate the chocolate by over-mixing. Transfer batter to prepared cake pan and bake for 35-40 minutes, until a thin crust has formed and cake doesn’t wobble when gently shaken. Make sure to bake gently. You want to bake this at 325 F. Do not open the oven door before 35 minutes of baking or the cake will fall. Check the cake at 35 minutes and give it a gentle shake. To know the cake is ready, the cake should not be wobbly and a thin top crust will have formed. Let the cake set up in the pan for at least 30 minutes before removing. Because this cake lacks the same structure that flour gives the cake, it could fall apart if removed too early from pan. Make sure not to over-mix your chocolate. This can agitate the chocolate, causing it to clump and lose it’s shine. When making the chickpea flour egg, mix the chickpea flour and soy milk completely. This is best done by using a small blender. Gently fold the dry ingredients into the wet. The more you mix, the more deflated your cake will be. Do not open the oven door while the cake is baking or it may fall. Check the cake at 35 minutes and give it a gentle shake. To know the cake is ready, the cake should not be wobbly and a thin top crust will have formed. Serve the cake chilled with fresh berries and powdered sugar. Uneaten cake can be wrapped tightly and stored at room temperature. Eat leftover cake within 4 days. Looking for more decadent and delicious chocolate. 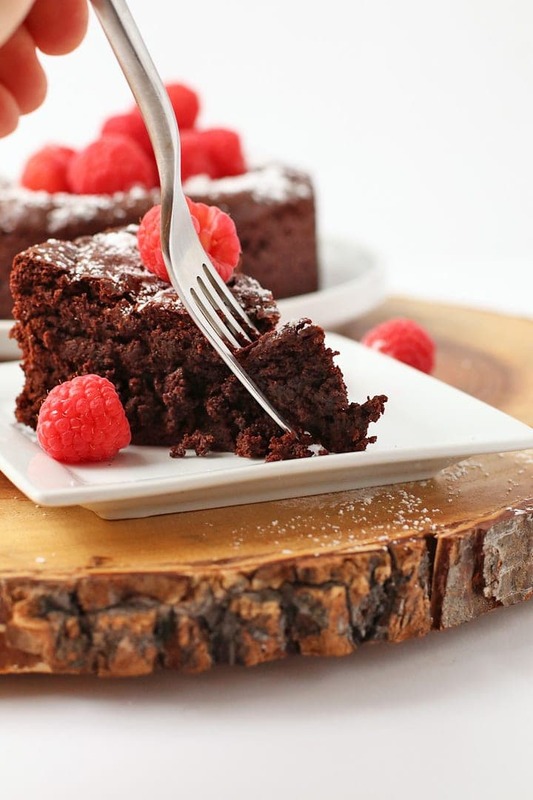 Make sure to check out these popular chocolate cake recipes from the blog. That’s it! I think you’ve got it. 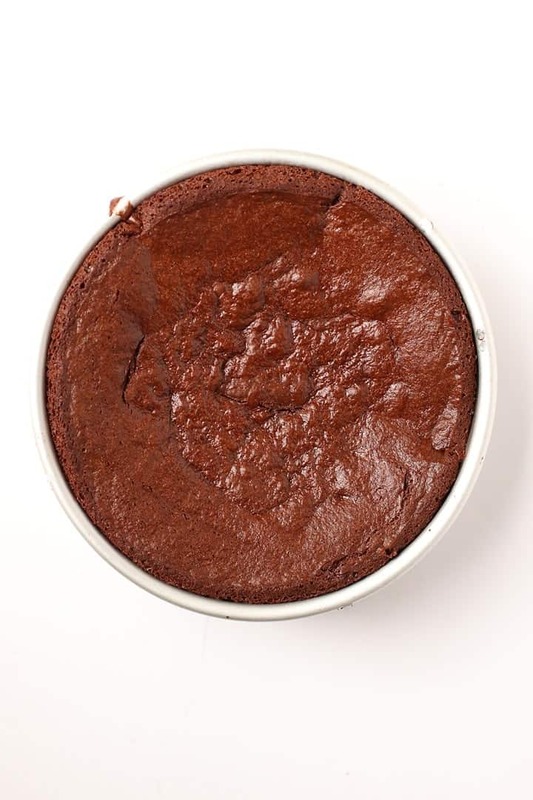 Ready to make some vegan flourless chocolate cake with me? Let’s go! Preheat the oven to 325 F. Generously spray a 6" cake pan and set aside. 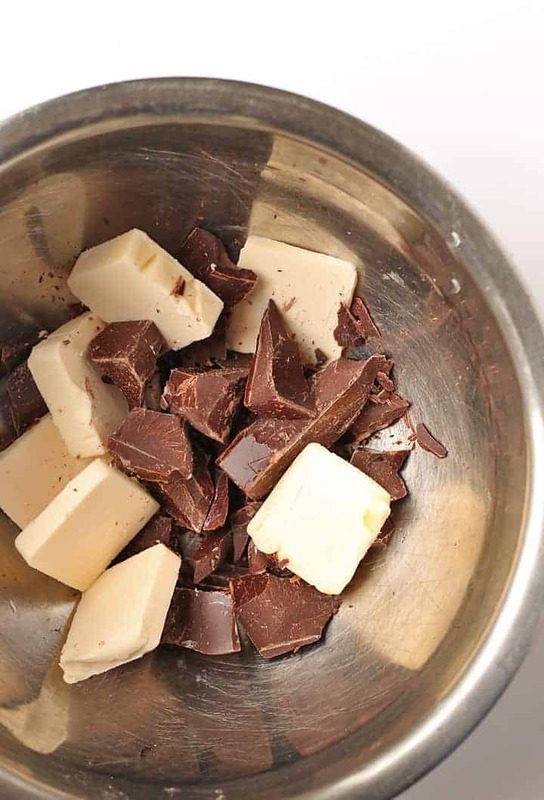 In a double boiler, gently melt the chocolate and butter together, stirring occasionally. While chocolate melts, whisk together chickpea flour and soy milk until a thick gooey paste has formed. Make sure chickpea mixture is evenly hydrated throughout. Once the chocolate and butter are melted, stir in sugar until it is dissolved. Add chickpea/milk mixture, stirring with a spatula to combine. Fold in cocoa powder and baking soda until a uniform batter is achieved. Transfer batter to prepared cake pan and bake for 35-40 minutes, until a thin crust has formed and cake doesn't wobble when gently shaken. Remove from oven and let set up in pan for 30 minutes before transferring to a wire cooling rack to cool completely. Refrigerate until ready to serve. Dust with powdered sugar and fresh raspberries to serve. Do not eat this batter raw. Chickpea flour has a very potent taste when consumed raw. This is completely disappear once baked. I need to serve 16. Would tripling the recipe and using a 10” pan work? Have you tried a water bath? It might be a little harder time getting the cake to keep it’s structure since it’s such a delicate cake, but it might work just fine! Just adjust the baking times accordingly. Hi! I made this and hadn’t read the note about the chickpea flour tasting strong and added a bunch of maple syrup to mask it Whoops! It tasted delicious anyway! Question – I want to make it again, but only have almond flour – do you think that would work? Thanks! I made this for Thanksgiving and it received rave reviews from everyone! I’m the only veggie (transitioning to vegan) and we have at least three family members with celiac disease. To find such a crowd pleasing desert recipe was so exciting. My very un- vegan father has already requested another one soon! I followed the directions to the letter and served with a simple and easy homemade raspberry sauce. 10/10 will make again and again! Thank you for sharing!!! I will be baking this cake for my bday soon but i only have a 8inch cake pan not a 6inch, how do i alternate the recipe for a 8inch cake pan? As well what would be a good substitute for chick pea flour? I would prefer to use something i already have, would GF flour work? Hey Breanna, do you have a 9″ pan? If so, I would double the recipe. 8″ is a little tricker because you’ll want something between 50% and 100% increase to the recipe. If you only have an 8″ pan though, I would recommend increasing the recipe by 50% and it will be a little bit shorter. Unfortunately, this recipe relies on the chickpea flour for the egg replacer. Traditionally flourless chocolate cake is held together by eggs and is custard like. Substituting the chickpea flour with GF flour would change the texture and taste too much. Could I use coconut flour instead of chickpea flour? I have some lying around and would love to put it to use! No, the chickpea flour when mixed with water creates an thick, protein-rich egg replacer which is the base of this cake. Coconut flour would not do the same. Any soy free, nut free, dairy free, coconut free milk you might recommend? Hemp seed milk? Or would just water work? Could you do oatmeal? That might be your best option. Otherwise, hemp milk would also work. I love cashew milk for creaminess. I also will use macadamia nut milk sometimes for a creamy, relatively flavor-less milk. You should definitely give either one of them a try!